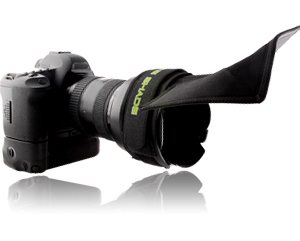 The Flex Lens Shade is an adjustable flexible lens shade that fits any SLR lens. The Flex Lens Shade is the only tool on the market to block unwanted light flare. At only 1.2 ounces, the Flex Lens Shade will become a tool that you always carry in your camera bag every day. The Flex Lens Shade was developed to be durable, professional and lightweight. With its Ballistic Nylon shell, double stitch sewing and finished edges, the Flex Lens Shade is durable for everyday use. The Flex Lens Shade's unique design and finished look will impress clients instead of the old gaffers tape you may have used in the past to block unwanted light. At only 1.2 ounces, the near weightless Flex Lens Shade can be carried in your camera bag everyday with its lay flat design and lightweight feature. Sun flare, indoor light flare and studio light flare can ruin an excellent image. Flare can also ruin an image due to the focus unit trying to focus through the flare causing the image to be out of focus. Often you are not able to move to avoid the light flare or maybe didn’t notice it when taking the photo and that moment is gone. Put the Flex Lens Shade on your lens and never have a problem with light flare again! Get your Flex Lens Shade today!